Y&R Thailand worked with LG to run the “Seafood Aquarium”, an award-winning ambient advertising campaign promoting the LG SolarDom microwave oven. Robotic seafood, designed in forms ready to cook in a microwave, was placed an aquarium in the food court of a large Bangkok department store. Grilled Saba with Soya, Fried Mackerel and Deep-fried Shrimp swim like real fish, with the tagline, “Ready to eat. 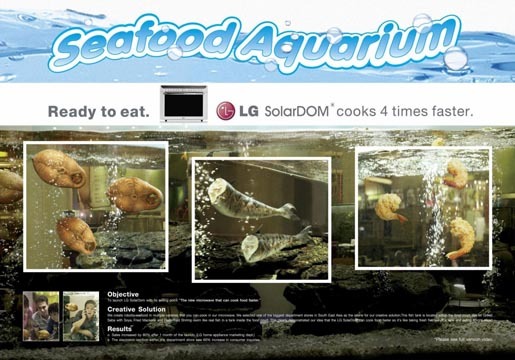 LG Solardom cooks food 4 times faster.” This clearly demonstrated our idea that the LG SolarDom can cook food faster so it’s like taking fresh fish out of a tank and eating it right away. The store’s electronics section experienced a 60 percent increase in consumer inquiries. The campaign won a Gold Outdoor Lion at Cannes International Festival of Creativity. The Seafood Aquarium campaign was developed at Y&R Thailand, Bangkok, by chief creative officer/copywriter Trong Tantivejakul, chief creative officer/art director Marcus Rebeschini, executive creative director/art director/copywriter Jon Chalermwong, art director Somchok Kunjaethong, copywriter Parist Auttayatamavittaya, editor Watchara Eamsangsai, account managers Narong Chokpiboonkarn, Chotirot Rattanawaraha and Apiporn Kunakorn, producer Pannapa Donavanik. Photographer was Jasda Trivittyanuruk, Fiftyone Bangkok, with image composer Kae-Dad. Filming was shot by director Panusard Thanachindawong at The Film Factory, Bangkok.